The modern buyer, like the modern marketer, is obsessed with data. We love to know about our activities — who did we talk to? What did we tweet about and search for? How many blogs did we write and which got the most attention? And, what life events happened? This type of information fuels annual “year in review” campaigns that many companies develop to feed our need for information. But compiling this information and neatly packaging it for user consumption across a large platform, like Facebook, for example, is often easier said than done and might not work for every organization. But, like any well-thought out campaign, part of your creation process should be identifying goals. So if you are looking for a way to boost sharing and engagement or your brand image, think about running a year in review campaign. Another example of social sharing as a goal is Facebook’s personalized year in review. You probably have seen these pop-up in your newsfeed, or even created your own. This campaign promotes social sharing in an important and unique way — by allowing users to personalize the campaign. Users who view their friends’ year in review land on a call to action at the bottom to create their own. Once a user clicks, Facebook pulls together the posts and pictures that have high engagement. But, if that’s not the story you want to tell about your year, the application allows and encourages you to customize it. Almost everything is customizable about the year in review campaign, which is what makes it so effective. People are more likely to share something that they invested time in and created than an auto-generated recap. Building your brand is another benefit to this type of campaign. Marketers can use year in review campaigns as an opportunity to generate buzz, and reinforce their position in the market for their fans. In the example below, Twitter’s year in review, focuses on driving buzz of specific news stories while reinforcing that they are the go-to spot for breaking news and discussions. Their campaign highlights the most popular hashtags of each month in 2014, and then allows users to dive deeper into the story and look at individual tweets. 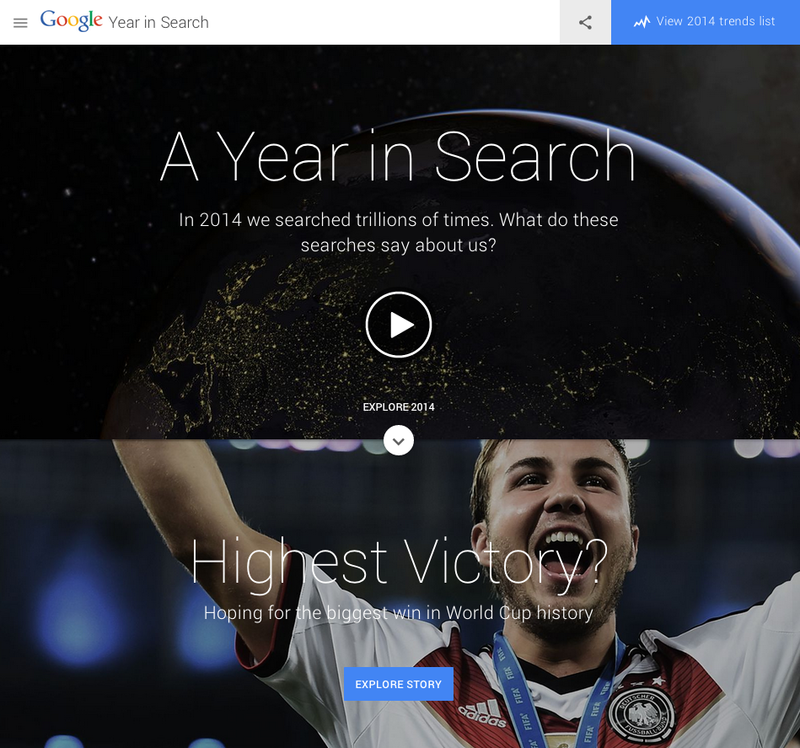 In a similar style, Google’s year in review offers users a recap video of the important moments and stories that happened in 2014, through the lens of search. Their video reinforces Google’s presence as a primary source of information. Additionally, Google offers their data on top searches for the year so users can explore. Marketers utilizing this type of campaign also look to drive users to engage with their product. Driving product engagement, especially in a subscription business, offers the organization the benefit of increased loyalty. If a user has already invested time and money into learning the platform and adapting it to their needs, they are less likely to abandon their subscription for a competitor. Essentially, driving engagement makes a product ‘stickier’. It also provides a good opportunity for upsell (an upgrade in features for higher fees); once a user has explored all the aspects of the product, they are more likely to upgrade and unlock more capabilities. A good example of driving engagement with a year in review campaign comes from Spotify. Spotify’s main goal with this campaign is engagement, but you’ll notice that they also drive sharing and brand building. As Spotify presents their data on the year in music, they encourage users to listen to the playlists and follow top artists and songs. 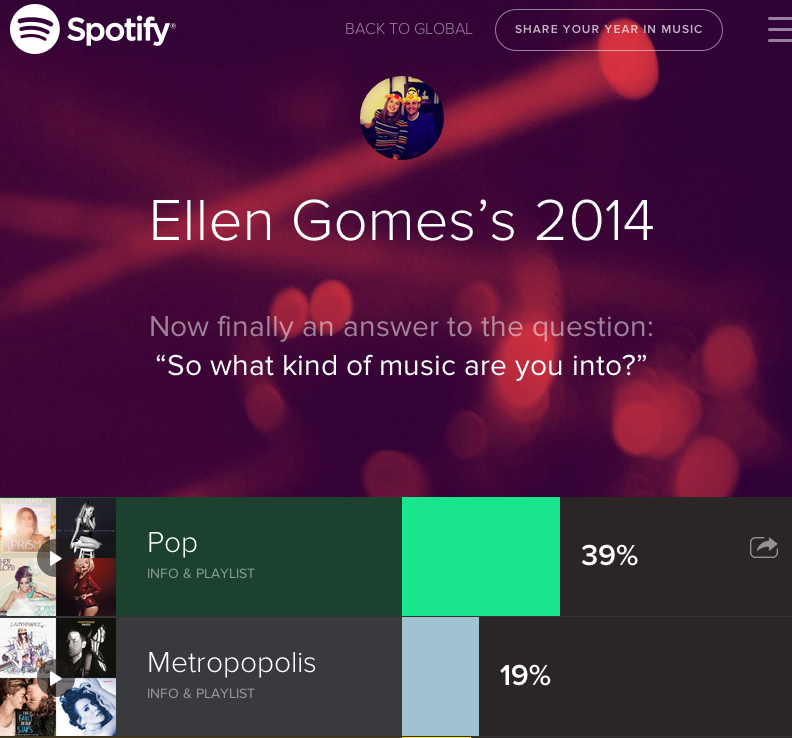 At the bottom of their year in review data, Spotify prompts users to create a personal report that recaps their individual listening data as an infographic. At the end of the personal report, Spotify prompts the user to upgrade. So while you peruse year in review campaigns, make sure to take note of the goals for each campaign. Like any marketing program, year in review campaigns don’t happen overnight; they take plenty of careful planning and data-mining to create an awesome year-end recap that successfully drives to the goals of the organization. I hope these examples help you determine if this type of campaign is a fit for your organization.